A duvet is a crucial component of your sleeping experience, and if you get this wrong, it could worsen the quality of sleep you get each night. The best duvet for you will largely depend on your personal preferences and be determined by factors such as your ideal temperature, filling and tog. Duvets are an everyday item which means that many manufacturers produce them. While this is good because you have lots of choices, it can also make the purchasing decision harder because of all the products available. We’ve created this buying guide to show you the best duvets you can buy and the factors you need to consider before making a final decision. 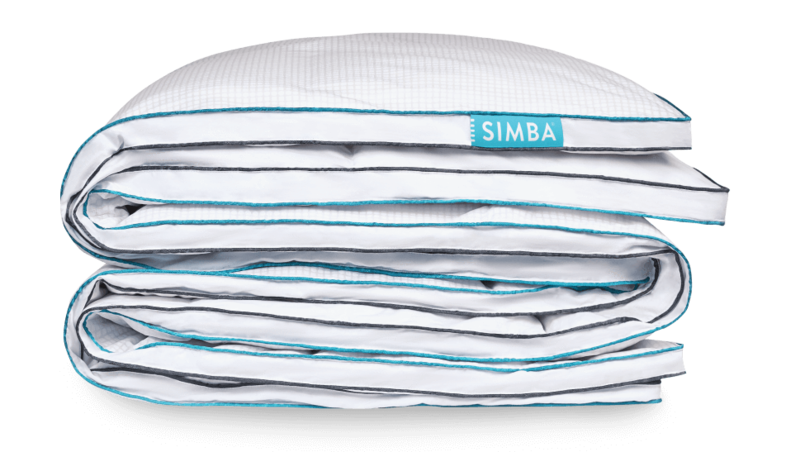 Simba has cemented its name in the mattress manufacturing space, so it was only a matter of time until they spread their product offering into duvets. Their mattress suits all types of sleepers, so it’s little surprise that they have created a hybrid duvet that’s suitable all year round. The duvet filling is 90% down and 10% feather which creates a cosy yet breathable product along with a 300 thread count which ensures that it’s long lasting. The duvet also uses outlast technology which means that it responds to changes in temperature. For example, if you get too warm, then it will disperse heat to cool you down. Similarly, if you get too cold, then it will release heat to warm you up. This has also been official space certified so you can trust this technology works. 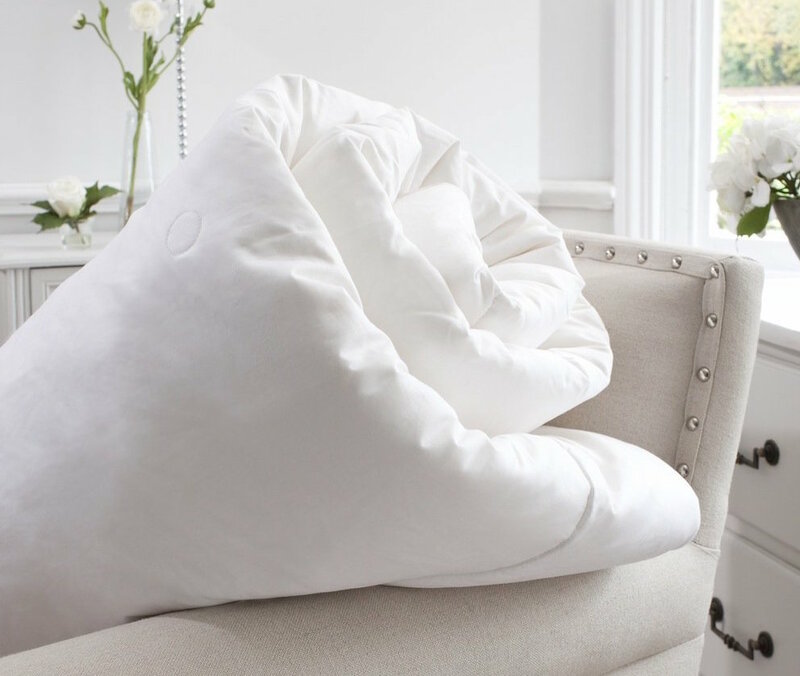 The duvet has a tog rating of 10.5 which allows it to be used all year round in all seasons while each pocket within the duvet has been stitched which means that the filling never moves, so you never need to shake it to regain its original shape. Eve Sleep has created a temperature regulating duvet that can challenge even the best duvets available on the market. The duvet is 70% microfibre which creates a soft and light filling while also promoting air circulation to keep you cool throughout the night. Where this differs from traditional down is that it still has the same warmth qualities but without the weight. 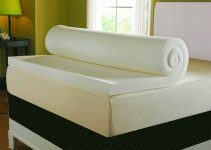 The way the duvet has been constructed also ensures that the filling stays in place to maintain a consistent shape. The remainder of the filling is made up of Tencel which regulates temperature and humidity. Also, it works in combination with microfibre to ensure that you stay warm but without overheating and becoming uncomfortable. There are four tog sizes available depending on your needs including an all-season duvet. The duvet also protects itself against bugs and germs and is the best hypoallergenic duvet making it ideal for those who have sensitive skin or suffer from allergies. Also, the duvet is supplied with a 2-year warranty to protect you against any faults that may develop with the product. 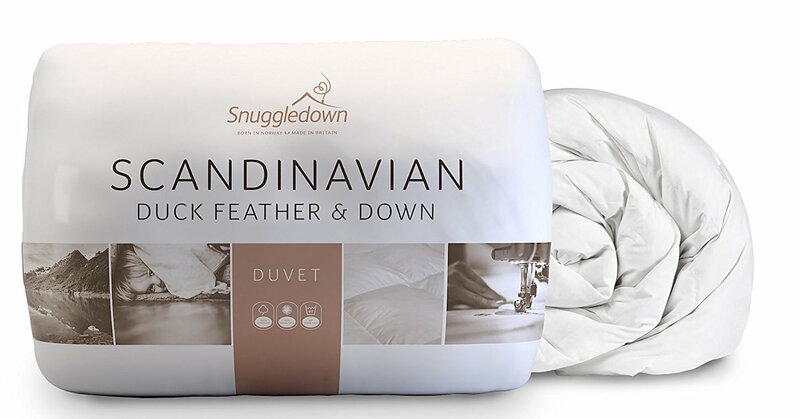 The Sunggledown duvet uses a combination of 15% Duck Down, and 85% Duck Feather to give you warmth but also has weight to provide you with that cosy, comfortable feeling. The filling is then encased in a 100% down proof 230 thread count cotton cover which provides the duvet with a soft touch, while also allowing sufficient air flow to prevent you from overheating. There is no need to continually shake the duvet because it has cassette style stitching to ensure the fillings remain evenly distributed within the duvet. 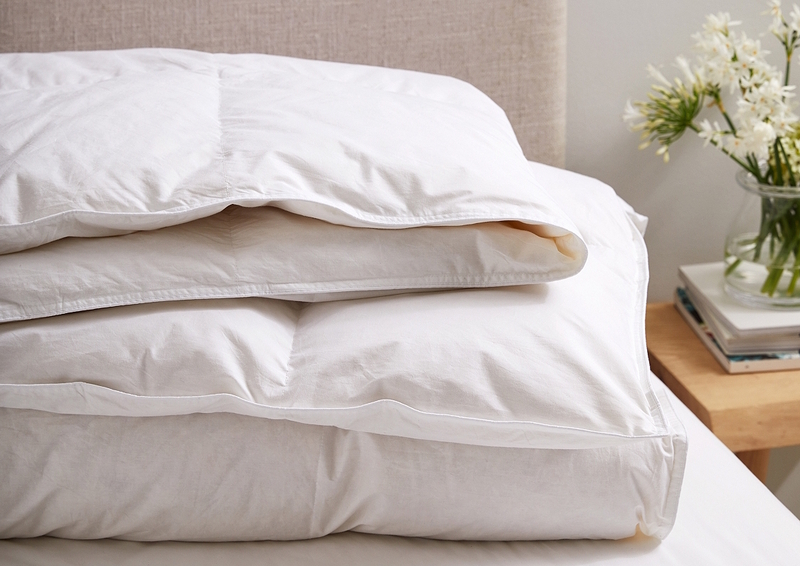 The duvet is also extremely easy to care for and can be machine washed so you can keep it as fresh as possible. The duvet is also non-allergenic which means there are no materials in it that can trigger an allergic reaction. This is essential if you’re an allergy sufferer. The duvet is also ideal for all times of the year but also comes in lower togs if you’re specifically looking for a cooler summer duvet. Fogarty and a UK based brand that has been manufacturing sleeping essentials for over 100 years, and you don’t stay around that long if your products aren’t high quality. 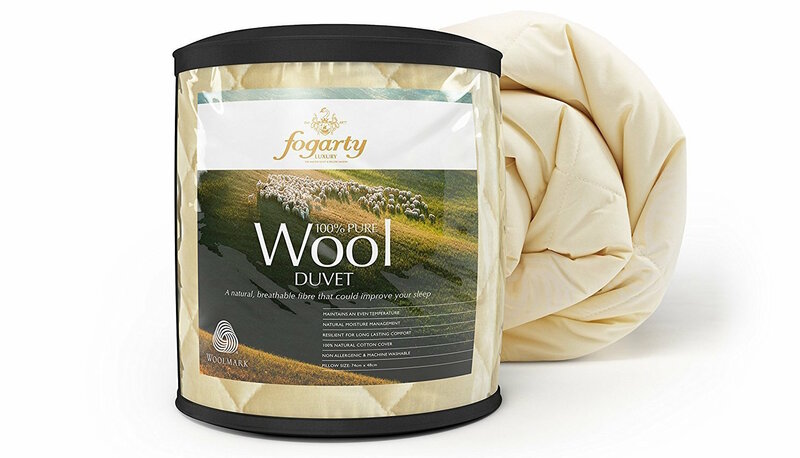 The Fogarty wool duvet is manufactured using 100% New Zealand sourced wool which is then encased in a lovely soft cotton cover which adds a layer of warmth and comfort. One of wools main qualities is that its temperature regulating so it doesn’t have tog ratings as it will adjust itself depending on the temperature and seasons. So in summer, it will naturally keep you cool, and in winter it will keep you warm. Wool is naturally anti-allergenic, so it resists the build-up of bacteria and dust mites so if you're allergy sensitive, this will create a cleaner and safer sleeping environment. The duvet is also easy to maintain and can be machine washed at 40 degrees so you can clean it regularly to keep it fresh. This duvet will stop you having to continually flick your duvet on and off during the night and having to choose between buying a summer or winter duvet as it does both. 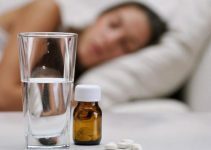 One of the most significant a problems that a couple may encounter is sleeping arrangements ranging from the size of the bed to the firmness of the mattress. Different people have different preferences which mean that one persons favoured tog rating is not the same as another’s. For couples that can’t agree on this, a solution has been made which is a dual duvet which is ideal for couples. It features a unique design which means the duvets tog rating is split down the middle with one half being a seven tog and the other half being 14 tog. The duvet has a Poly cotton cover and a soft hollow fibre interior filling which keeps you warm throughout the night. Whilst also allowing air to flow freely in and out to keep you cool. The duvet is also hypoallergenic to ensure that you don’t suffer from allergic reactions, but it also means that your bed will remain fresher for longer. When it comes to cleaning the duvet, this is simple and can be machine washed at 30 degrees. Silk is a luxury duvet filling and comes with a premium price tag, but you won’t be disappointed by its performance. The All seasons Silk duvet is an all season 9 tog duvet making it suitable for use all year round. The filling is a 100% grade A long fibre Mulberry Silk so you can see that All Seasons have stuck to using premium materials to give the best sleeping experience. The duvet is also hypoallergenic making it resistant to dust mites so if you suffer from allergies this will provide you with some much need relief when you go to bed. Also, the duvet doesn’t need to be shaken to maintain its shape and material distribution because the duvet is woven together using box and circle stitching. Silk rarely needs washing or cleaning but can simply be hung outside to let some fresh air circulate through the fibres. The beauty of silk duvets is that they appear to be thin, but they are extremely warm throughout all seasons. John Lewis is one of the leading UK brands when it comes to high quality long lasting goods and this Hungarian Goose Down duvet is no different. The filling is sourced from the highly insulating Hungarian Geese feathers which are not only extremely warm but at the same time light to create a cosy environment on even the coldest nights. The duvet is designed and sewn into even divided square boxes which means that the filling is distributed evenly so you don’t need to shake it and there will be consistent warmth across the duvet without any cold spots. It’s difficult to find a duvet that's both extremely warm and lightweight. 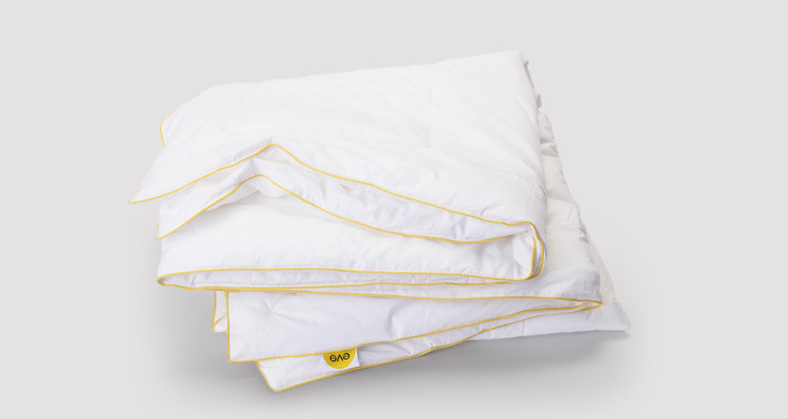 Rated as Nomite, this allows the duvet to be used by allergy sufferers without the threat of a flare up as the tightly woven fabric cover acts as a protective barrier against dust mites. This duvet is high quality which has also been back by a 5-year warranty by John Lewis to give you that added peace of mind. 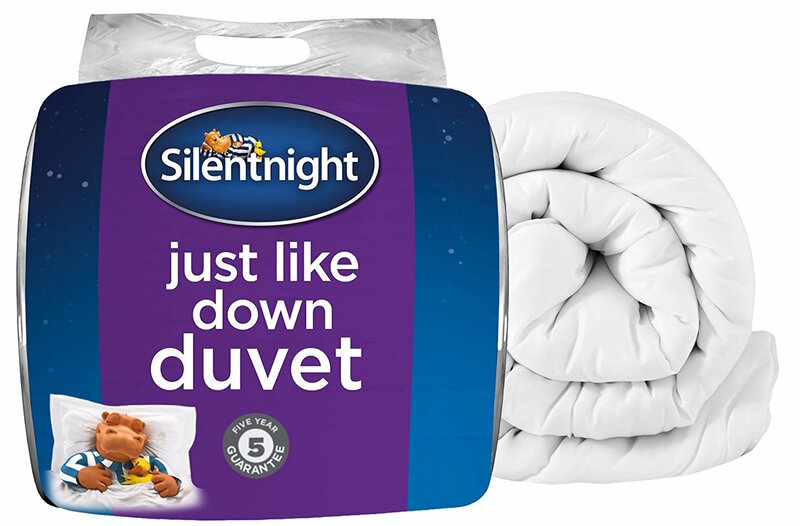 Everyone has a different budget that they have to spend on a duvet, so if you’re looking for a cheap duvet or perhaps it's just for a spare room, then the Silentnight Just Like Down duvet is the product for you. The duvet is both soft and warm without having a substantial financial outlay. Filled with soft fibres, the duvet mimics the feeling of Down to ensure that you stay comfortable for the whole night. The duvet is also well suited to the cooler months of the year and is also hypoallergenic meaning that it doesn’t use any materials that could trigger an allergic reaction. Caring for the duvet is also easy as it is machine washable. The duvet also comes in a tog rating of 10.5 which is great for all-round use, so you stay cool in summer and warm through the winter. The duvet also comes with a 5-year manufacturers warranty, so if a defect does develop, Silentnight will be there along the way to assist you. 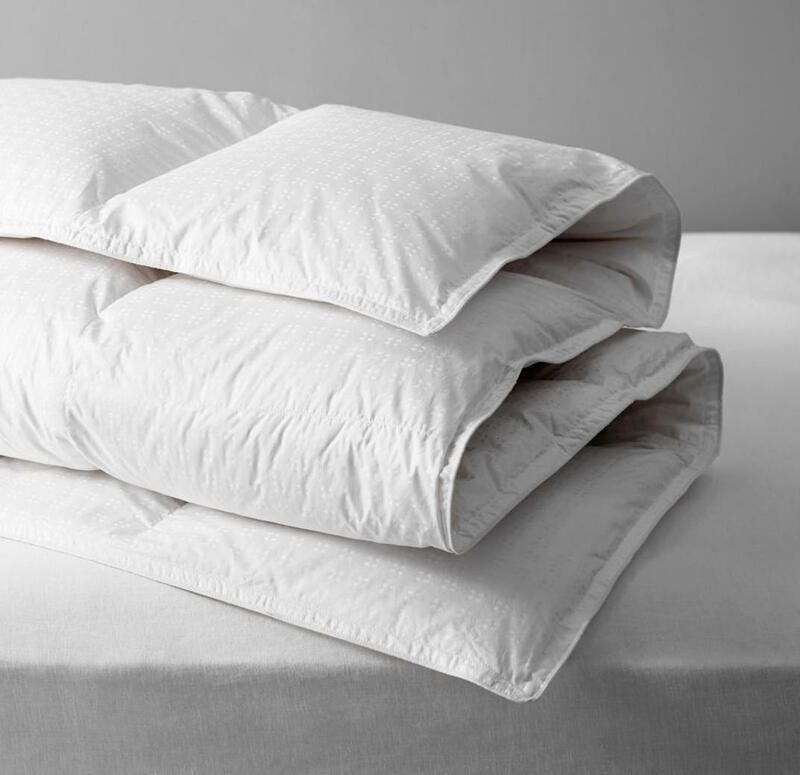 If you’re someone who tends to sleep hot or you’re looking for a duvet specifically for summer, then it’d be recommended to buy a duvet with a lower tog rating — the White Company 4.5 tog Duck Feather & Down Duvet. The duvet has a filling made of 85% European duck feather and 15% European duck down, which means it can retain plumpness while feeling soft and comfy. The filling further stays plump because of its internal box construction which not only means you don’t need to shake it, but there are also no cold patches along the duvet. The filling is then encased in a 233 thread count cotton case which stops feathers from poking through to maintain the soft and cosy feeling. The low tog rating means that the duvet is lightweight allowing for more airflow to keep you cool and sweat free. The duvet comes in all the standard sizes you’d expect and is also machine washable for quick and easy care. So now you no longer have to struggle through the warmer season with a heavyweight duvet making you feel uncomfortable. Synthetic duvets are becoming increasingly popular because they are both comfortable and affordable which is great if you need to buy several duvets at once. The 4.5 tog duvet is ideal for summer nights or if you tend to get very hot when you sleep, whereas the 10.5 tog is an all-season duvet. You can then combine the two duvets to create a 15 tog duvet which is best suited for the extra cold nights when you still want to be cosy. Although it has a high tog rating because it is synthetic, it's still lightweight, and it’s also efficient at retaining its original size even after washing and drying. The duvet is also washing-machine and tumble-dryer friendly. 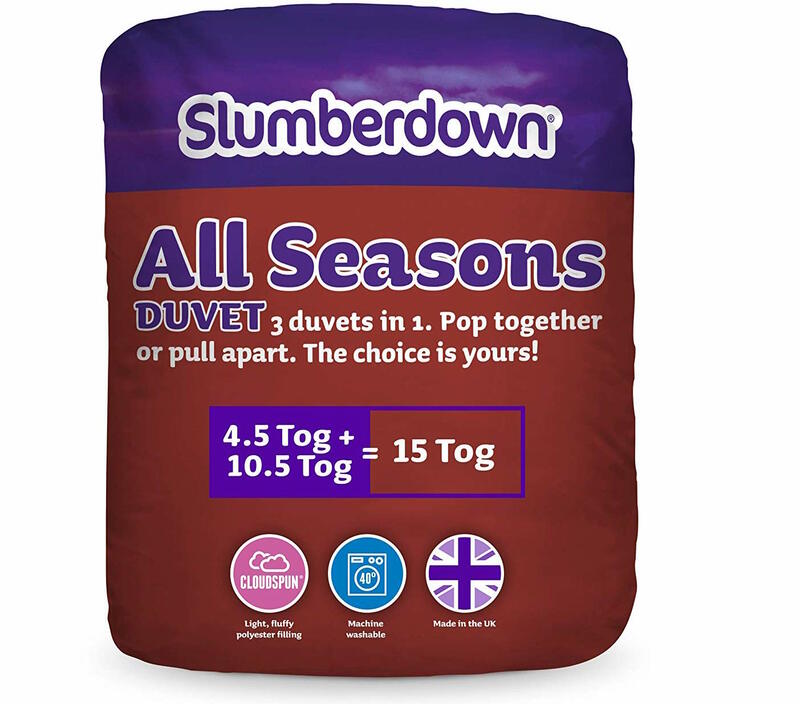 Slumberdown has ensured that the duvet is non-allergenic so it will not cause any adverse allergic reactions. Duvets main differentiating factor is the Tog rating. Tog rating essentially informs you of how warm a duvet will keep you when you use it. Generally speaking, the higher the rating, the warmer the duvet will keep you, whereas lower tog ratings will keep you cooler. Every duvet will have this rating to show how warm it is and how efficient the material within the duvet is at insulating. Other factors will be affected by the tog rating such as softness and weight. It’s essential that your duvet remains at the optimal temperature because it will mean that you stay comfortable for the full night which will lead to a more restful sleep. It’s not a pleasant feeling overheating throughout the night and waking up in a pool of sweat. Tog values usually vary from 4.5 up to 15 and go up in increments of 1.5. A light summer duvet will be at the 4.5 Tog mark whereas a cosy warm winter duvet will be between 10.5 and 15 Togs. The material that’s used will primarily impact the tog rating because some materials will be denser and warmer whereas others will be lighter and cooler. Now that we’ve explained what duvet tog means and now you know how important it is, we will now outline which tog rating is most suitable for each season of the year. This is one of the lowest Tog ratings and will be lightweight which makes it ideal for warmer summer months where you want to prevent yourself from overheating and sweating especially on the warm summer nights. This will be slightly denser than a 4.5 Tog option but will be ideal for the summer months and the periods between Spring and Summer and Summer and Autumn where there can still be warm nights but also may be some slightly colder nights. A 10.5 Tog duvet is best suited to Spring and Autumn seasons allowing you to stay cosy and warm without needing a heavier duvet to keep you comfortable. This is ideal for the winter months which will insulate and trap heat within the duvet to ensure that you stay warm throughout. Of course, it’s not practical to buy and maintain four different duvets especially if you have more than one bed in your home. This is where an all season duvet can be much more effective. An all-season duvet has two separate lightweight duvets which when combined create a higher tog duvet making it better suited for winter. This will also mean that you only need to buy one duvet and you can use it all year. The duvet filling refers to the material that is used inside the duvet. This will affect the overall feel, warmth and weight of the duvet, so it's an important decision in the buying process. Feather filling uses the outer feather of Ducks and Geese which contain quills and are heavier which traps a higher level of heat to keep you cosy and warm. Down filling refers to the softer fluffier material that’s found underneath, the longer outer feathers of geese and ducks along their stomachs. This makes it more lightweight. Modern duvets usually feature a blend of the two which makes it more effective and higher quality because the Down will give the duvet it's fluffy feeling whereas the feathers will provide it with a weightier feel to keep you warm. Synthetic duvets are one of the most common fillings because they are not only comfortable but also affordable while keeping you warm. They don’t have the same overall quality as alternative fillings but considering their price point they are incredibly effective. Hollow fibre duvets get their name from the fact that they're constructed using fibres which have spaces in between their structures. These hollow spaces promote air flow making the material breathable, and this is one of their primary qualities. Also, this is ideal if you want a warm yet lightweight duvet then hollow fibre is a good option. Of course, the higher tog you get, the plumper the duvet will be. Microfibre duvets differ from hollow fibre duvets because they are constructed using fine fibres that are woven tightly without the hollow spaces. These tightly woven fibres make the duvet warmer because it is more effective at retaining heat. The majority of microfibre duvets are often also anti-allergenic making them ideal for people who suffer from allergies. They are still lightweight compared to duvets with natural fillings but always keep that light feel. You’ll quickly realise that most duck and feather duvets will either use Goose or Duck feathers but it’s important to know the difference between Goose and Duck down. Goose clusters are usually bigger which makes them more effective at retaining heat compared to Duck Down. When it comes to overall quality and luxury, Silk duvets are near the top of the list and will usually be found in the most affluent of homes and hotels. They are both warm and breathable while also being extremely soft so you’ll fall asleep in no time. Silk is also great for temperature regulation which makes it great for an all-season duvet. Wool duvets are great for all year round use because of their ability to control the climate while also being a natural material. Wool is also extremely warm and soft because of its ability to retain heat through the colder winter months. The best duvet brands will often offer a warranty which gives you added protection that in the case the duvet becomes faulty or not fit for use, then you can return it to the manufacturer for a refund. The brand you select is essential as it will often be an indicator of the overall quality of the product. For example, a brand that has been around for many years has built up a reputation for creating higher quality products, whereas a newer brand may still produce high-quality products, but they may have fewer customer reviews and recognition. The price you pay will depend on many factors including the brand, size and material used. It may be tempting to spend the bare minimum on a duvet however this can be a bad idea because you may be uncomfortable while you try to sleep which can lead to you getting fewer hours sleep each night. Duvets also last many years so you should view it as a longer-term investment. Duvets come in the same size as beds to ensure that it fits the same amount of area. If you’re someone who wants to be a little cosier than normal, then its recommended buying a duvet that’s one size larger than you need which will give you a cosier snuggly feeling. Choosing a duvet used to be a simple process of just picking the first one that looked like it could do the job. But now with so many different fillings and types, it’s more beneficial to choose the best duvet that fits your sleeping preferences to improve the quality of your sleep, leaving you feeling more refreshed in the morning.